If you’re thinking about travelling to Japan, places like Tokyo, Kyoto, Osaka and maybe Sapporo would be high on your list. But travelling to some lesser-known places could give you a surprise of a lifetime. Of course you have about everything you could wish for in big cities like Tokyo however, how does and endless crystal blue ocean and private beach sound? I’m talking about Kagoshima, located at the southern end of Kyushu. Kagoshima consists of multiple islands and is a perfect combination of nature, culture, innovation and shopping. Tenmonkan in downtown Kagoshima for example is the number one shopping area in the southern Kyushu region and the JAXA’s Tenegashima Space Center is also established there. However, Kagoshima recently got extra attention again because of a few video’s of the beautiful nature there. Yakushima at Yaku Island, home to more than 1900 species of flora and a rare temperate rainforest, was captured on camera, as well as solitairy beaches and magnificent waterfalls. 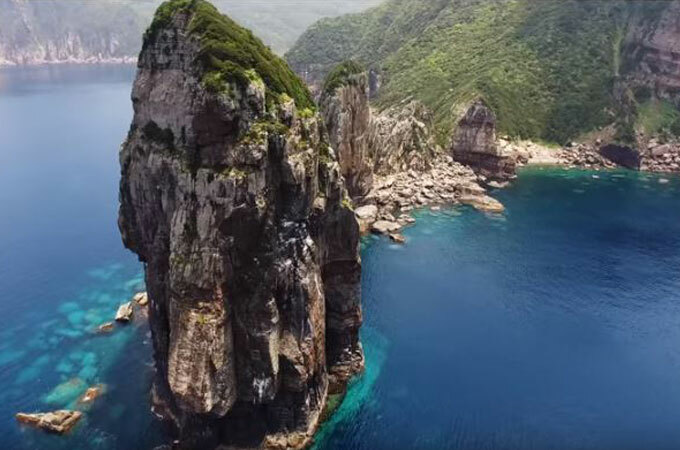 Yuki Eikawa captured this video below with a drone and I have to say: I’m sold. Dear obligations, when can I leave you behind and just go over there? If the video footage above does not impress you (I can hardly imagine), then maybe the other video Yuki Eikawa created will. This video is more concentrated on life in the villages and cities and is also amazing to watch. I especially liked the footage of the lanterns and glass creations in this one. Now this is also a reason why you should visit Kagoshima! If you’re in the neighborhood or planning a trip to Kagoshima, here’s a few things you just have to see: Yunohira Observation Point at Sakurajima mountain, Saraku, the one and only natural sand bath in the world and Senganen, a magnificent Japanese style landscaped garden which contains Sakurajima and the Kinko-bay as backdrop scenery. I’ll write more about these spots in the future, so check the website regularily. And these are of course personal favorites, so if you have any tips on places that I should write about definitely send me an email! Shiver me timbers, them’s some great intfnmaoior.